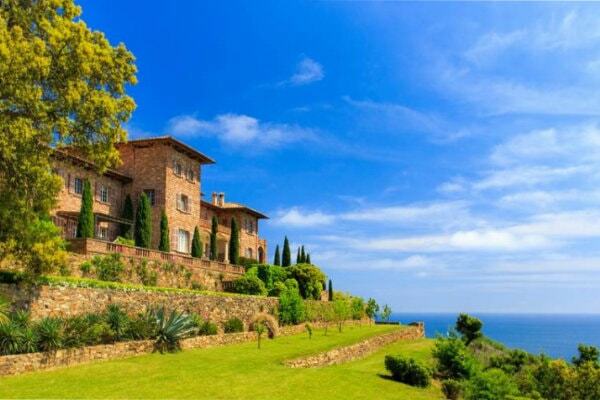 Welcome to the most beautiful scenery on the Mediterranean coast. 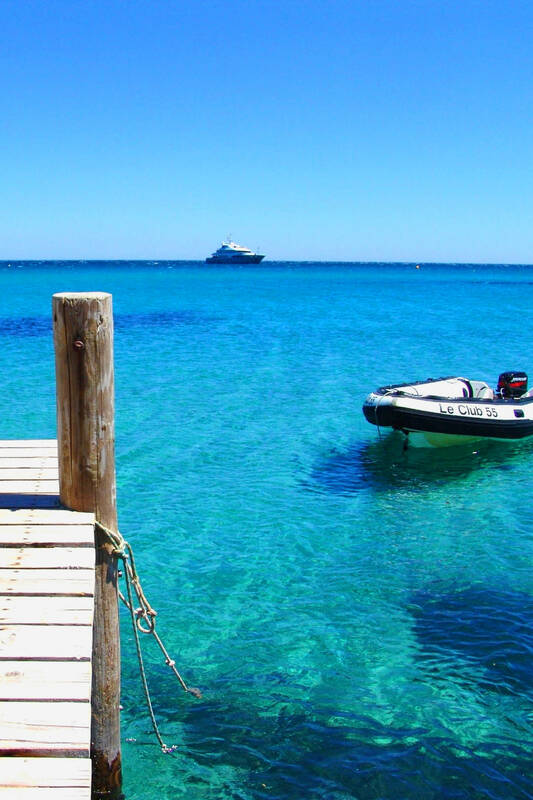 Pampelonne, a legendary sandy beach stretches over several kilometres, and a string of heavenly coves and rocky inlets reveal the same secret in different ways. 8th, 9th, 10th wonders of the world, detours and surroundings, a thousand treasures to discover. Many birds species coexist in our area: magpies, jays, carrion, crow,raven, redthroat, thrushes and the birds of the sea and coast. 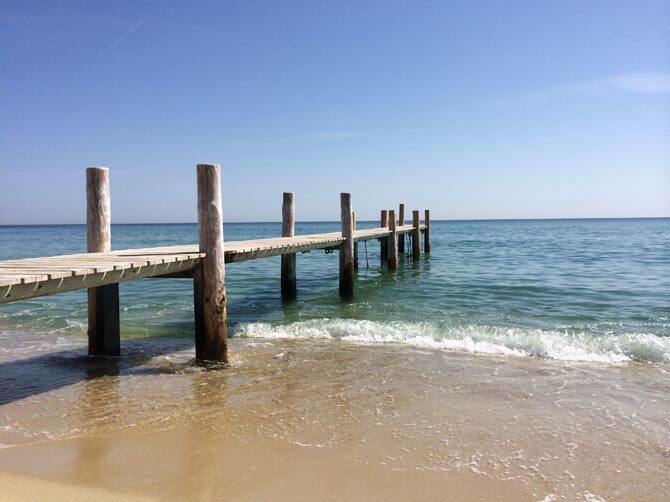 Located in the town of Ramatuelle, the Pampelonne beach is an area of 27 hectares that helped build the fame of Saint-Tropez when the stars of the fifties and sixties fell in love with it. Ever popular to this day, it is one of the most famous in the world. – “Tahiti Beach” installed in 1946, using the bamboo décor abandoned by the Victorine studios in 1935 during the filming of the movie “Song of the Islands” by Georges Manae. – “Club 55” (created in 1955), started as mere a simple canteen for the team shooting the legendary film with Brigitte Bardot “And God Created Woman” and became a fine and very well-known restaurant. – and finally “Epi Plage“, designed by Jean Castel and Albert Debarge, in 1960, as a seaside echo of the Epi-Club located in Paris Saint-Germain-des-Près. The establishment was immediately on the front page of the media because joyous parties attended there by the who’s who of cinema, fashion, music and politics. These beach establishments have seen for half a century all the celebrities of show business: Errol Flynn, Brigitte Bardot, Roger Vadim, Jane Fonda, Michèle Morgan, Gilbert Becaud, Sylvester Stallone Claudia Schiffer, Elton John, Johnny Hallyday, Paris Hilton, Tony Parker, Bono… and the list goes on and on ! 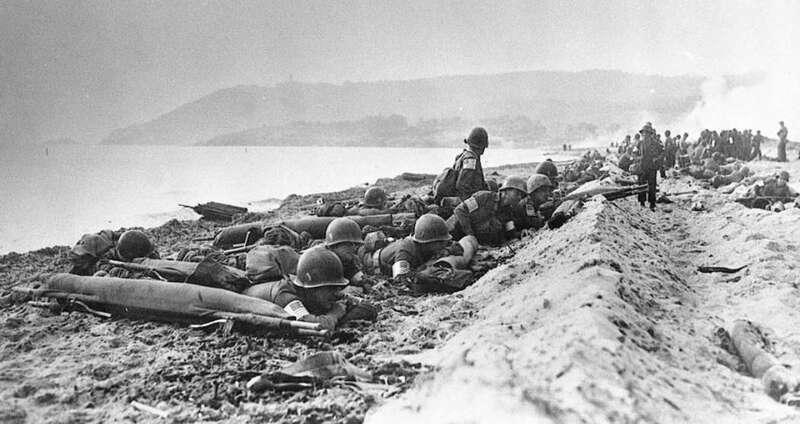 Small sandy beach that served as career in marine ballast for their boat to the benning of this century, Pampelonne was the scene of the landing in Provence in August 1944. At the landing of the Allied Forces on 15 August 1944, vines, shrubs, hedges of reeds were destroyed by bulldozers in order to develop in the parcel shelf (southern part) an airfield to an affair with bases in Corsica an North Africa. In between the cape taillat and the cape camarat, this familial beach is spread out on about 350 meters. Snorkel indispensable for exploring the seabed, unless you prefer to rent a kayak ! Not many people know about the cove. 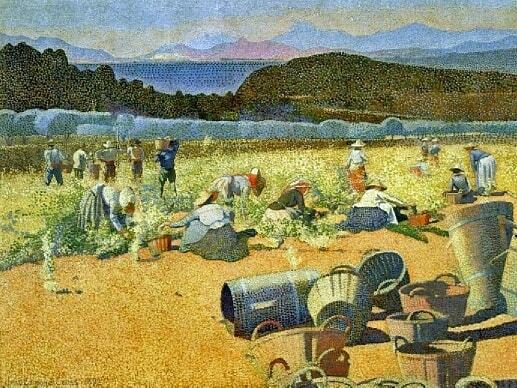 In the old days Bonne Terrasse was the stronghold of the fishermen of Ramatuelle. Located on the extrem South of Pampelonne, it is caracterised by a long semicircular stretch of sand of 150 meters. You can access there by stairs (10 minutes from the parking).Unsupervised beach. 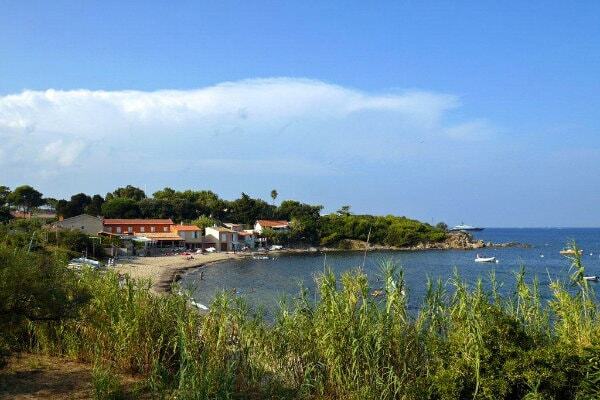 Situated on the coast of the littoral, at the foot of the Cape Taillat. Next to the sea, you will find the douane house. (built under Napoleon the first and recently restored). 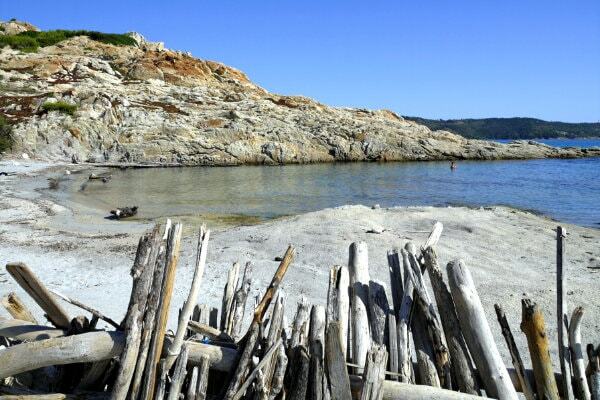 The white sand is one of the most beautiful of the Riviera, and the view on the Cape Taillat is beautiful. Unsupervised beach. WHAT DID THEY USED TO DO ON THE PAMPELONE BEACH AT THE XVIIe CENTURY ? In January 1634, a group of people went to Pampelonne and discover : “there was large number of people who worked at “amouloner” (in Provencal make a moulon means to do a bunch) algae that the sea had thrown and freshly vomited on board. Everyone who had vines in this area, would pick them up, because it grew and enjoyed their vines in abundance by smoking and maintaining by means of this alga’. Dominated by Camarat lighthouse, the second in France for the height of the light above sea level (130 meters) source, it owes its name to a manor of the fourteenth century. For safety reasons, the lighthouse cant be visited anymore. Classified in 1993 as a natural site, it dates of 1838. Electricity replaced petrol in 1946. 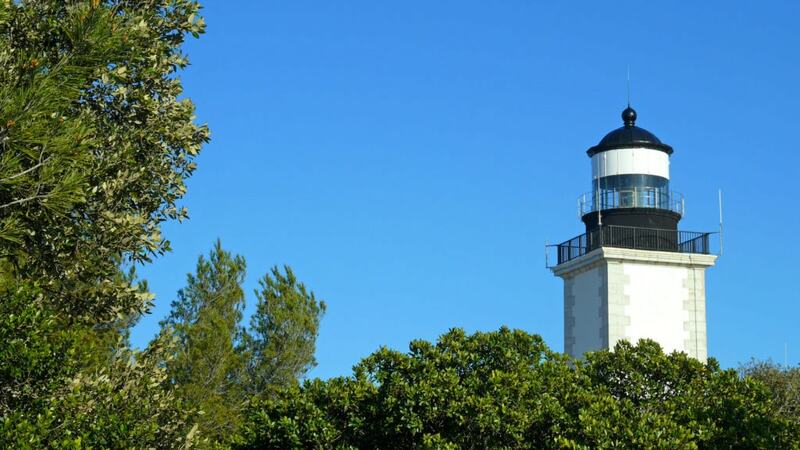 Since 1977, it is automated and remote from the lightouse of the island of Porquerolles. Its light signal with a range of 60 km, pace the beautiful summer nights with its white light grouped into 4 parts 15 seconds. 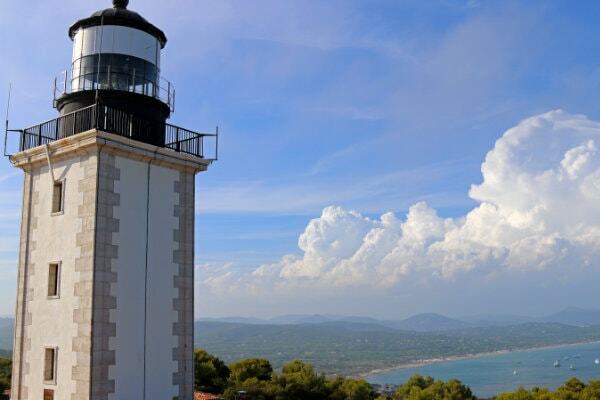 At the foot of his tower, by mistral time, it benefits of a dazzling light that allow to see the sea at infinite, the varois coast and his capes ; at west, the Golden Islands: Le levant, Port-Cros, Bagaud and Porquerolles. 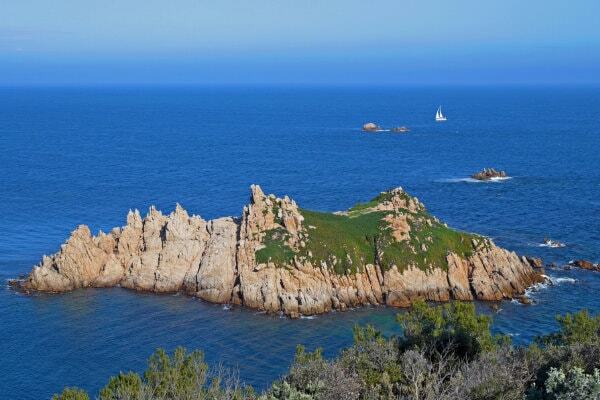 The walkers, take the little path that joins up the coastal trail (littoral), just before the “birds island”: to Est we arrive at Pampelonne beach in 50 minutes, to West, the Escalet in about 2:20 hours, and Cap Taillat in 3 hours. 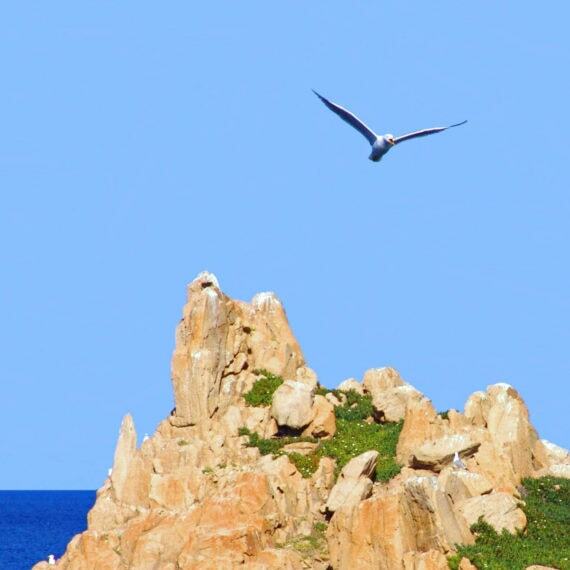 A few minutes walk from the lighthouse, you will see the bird island. Here, the stone of the rock is covered in white, brand dressed territorial, black birds called cormorans. Sometimes in summer, some brave swimmers try to approach it, but they dont star for long. Under the Cape Camarat, stone remains of a Napoleonic battery, reflect the coastal defense against possible attacks by the sea at the time of the blockade of 1804. From 1804, France is subject to a stric blockade by the coalition of European countries. Napoleon will organize the defense to protect themselves from dangers coming from the sea, installing batteries all allong the coast. You can see one of them on the coastal path. She was “army of three parts on lookout”. Note the Powder Keg, the small domed building protected by offshore rocks. After rounding Cape Camarat you will be surprised by the sudden vision of Volterra castle, one of the most prestigious areas of Provence Côte d’Azur. Built from 1906 to 1912, owned by wealthy Britons it was called Castle Camarat. It was bought in 1926 by Simone Volterra. She organized many receptions, marked by the presence of Raimu, Colette, Josephine Baker, Jean Cocteau. Now converted into a a vineyard. At the right of the beach of Pampelonne end, after the restaurant “Le Migon” on the coastal path, leaning against the rock you will discover a well (lou pous in Provençal). Lou Pous is a resurgence dust captured, developed and used by the fishermen of Ramatuelle to cool bottles of wine or to do the dishes in the summer. This source has the form of a well hence the name. 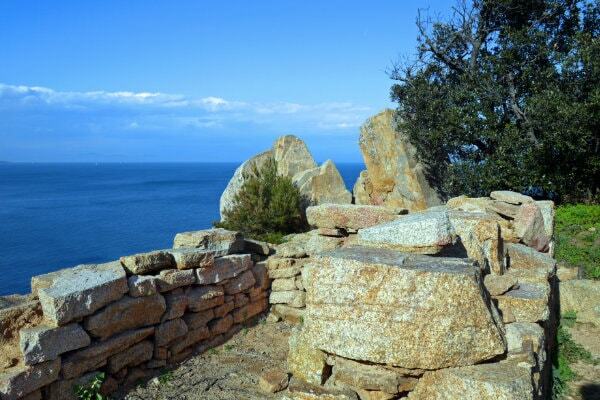 From the small private port of the Escalet, the coastal path will lead you 150 meters at a sculptural rock. 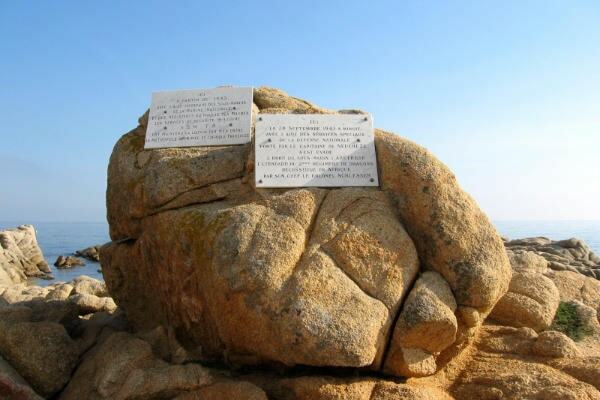 On this rock is a plaque commemorating the missions submarines and escape the standard 2nd Dragoon Regiment during the Second World War. You will only need 40 minutes walk from the Escalet beach to discover the eight wonder of the world! Our encestors were not deceived, them that 200 BC settled there. 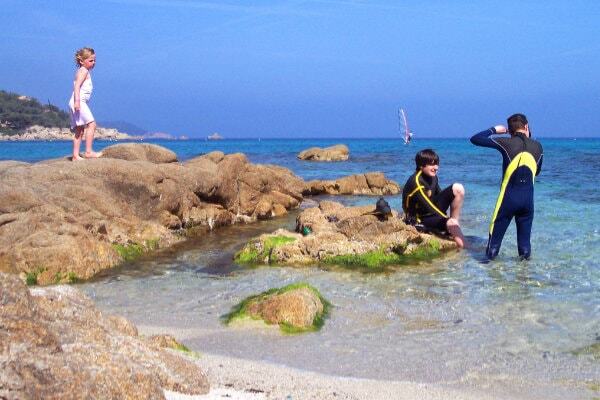 Natural border between La Croix Valmer and Ramatuelle this remarkable space, where flora and fauna are protected; sharing the marine space in two bays: Bay Briande (La-Croix-Valmer) and Bay Bonporteau (Ramatuelle), and allows you to find a sheltered place whatever the wind. 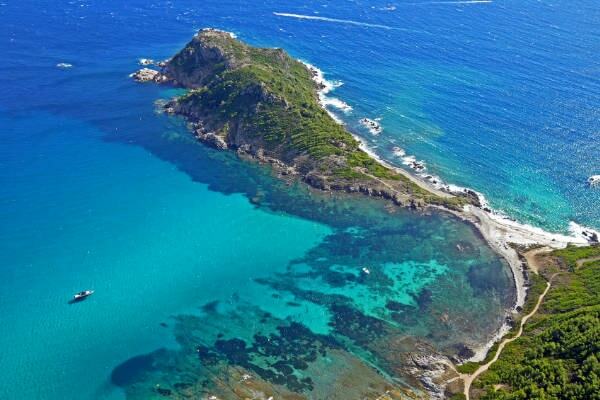 This site of an indescribable beauty was ranked in 1993 and acquired by the Conservatoire du Littoral. 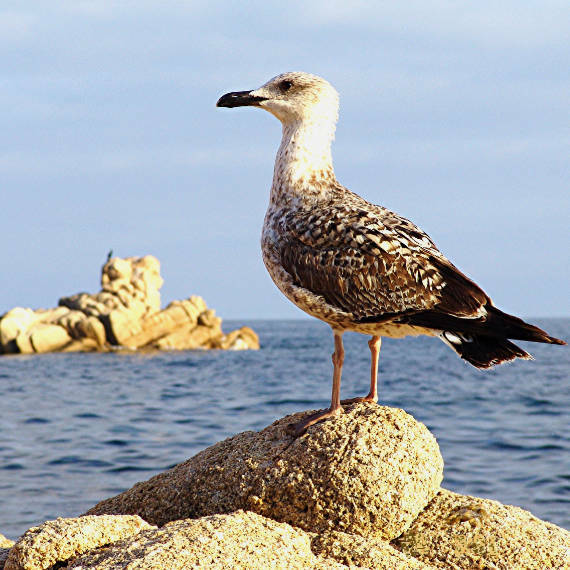 On the rocky coast along the coastal path is found mainly Yellow- legged Gull, called Provencal gabian : marked yellow beak red at the end of the lower mandible yellow-legged adult. Gull through several plumages of jevenil stage to adulthood. The young birds area rather in shades of brown, which gives it a dirty appearance, with a dark bill and legs pinkish. Adult, it is a pure white on the body, the underside of the wings, head and tail, gray on top of back-tipped wings stained white. You can see the doors of the Rock on the rocky coast of Cape Camarat. The Cormoran, entirely black, winter on our shores. From April to October he goes nesting Brittany coast and Scandinavian coast. It occurs often drawn on his feet with wings spread in a qualified position heraldry. 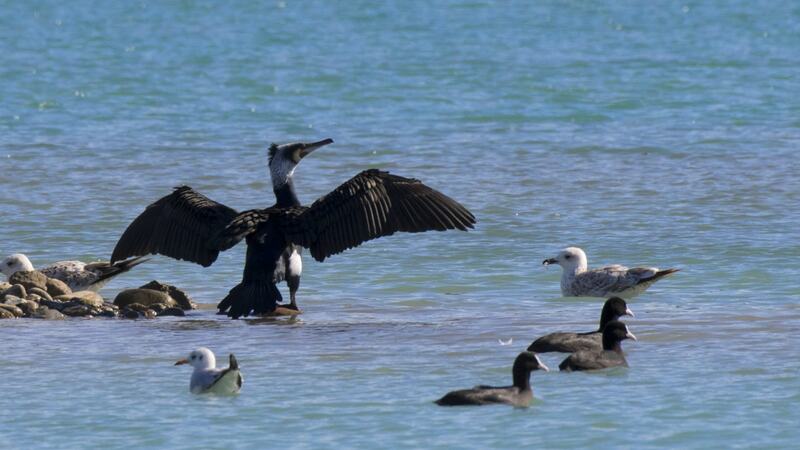 This position allows it to dry the wings. In Mediterranean, there are many species of birds close to the yellow-legged gull family Laridae : Seagull brown (the dark wins),The Gull ( red beak), The black-headed Gull (dark brown head), The Mediterean Gull (black head), Little Gull (very small), Tern, also called sea swallows, Common Tern (red beak) caujek Tern (black beak yellow trip), The Little Tern (the small beak yellow black trip). In spring, you’ll find the blue marlin also called Blue Rock Thrush. This very shy bird nests on the rocks above the customs house, where it is observable with field glasses. The male of a dark blue color is visible at the end of the winter because the weather is quite good., while the female incubates her babys, well sheltered in a hollow rock. With a little luck, you may encounter in the woods rabbits, foxes, squirrels, wild boar and the famous Hermann’s tortoise (protected species). You can find it at Turtle Village Gonfaron (40km of Ramatuelle) where in a park of 2ha, more than 2.500 turtles live in peace.